No CLE credit will be offered during the symposium. Killing over 115 Americans every day, the opioid epidemic has become one of our nation’s foremost health crises. The 2018 Kansas Law Review Symposium will bring together scholars of varying backgrounds to explore legal issues and perspectives related to this epidemic. Visitor parking in the Allen Fieldhouse Garage is available for $1.75 for the first hour and $1.50 for each subsequent hour. Recent changes require visitors to enter their license plate number and pre-pay for the amount of time they anticipate parking. This must be done within 15 minutes of arrival. More details from KU Parking. We accommodate persons with disabilities. Please submit your request no later than September 7 to cmai@ku.edu or 785-864-9208 TTY: 711. Scholarship associated with the symposium will be published in a Spring 2019 issue of the Kansas Law Review. Contact Symposium Editor Erica Ash at kulawrevsymposium@gmail.com. While the law is equated with justice, it is not free from the inequities that exist in society. The Kansas Law Review 2017 Symposium brings together legal scholars and thinkers from a variety of perspectives who will address how inequity affects their fields of expertise, including education, immigration and business. Scholarship associated with the symposium will be published in a Spring 2018 issue of the Kansas Law Review. Contact Symposium Editor Meghan Harper at kulawrevsymposium@gmail.com. 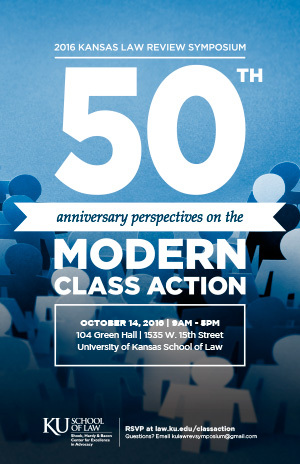 On the occasion of the 50th anniversary of the 1966 Amendments to Rule 23, the symposium will explore the emerging challenges and contemporary contours of the class action. A prestigious collection of scholars, judges, and practitioners will address topics including the ascertainability of class members, post-Comcast heightened scrutiny of class damage models, dual certification of money damages and injunctive class actions, application of the cy pres doctrine to class actions, and the expansion of class actions globally. We accommodate persons with disabilities. Please submit your request no later than October 7 to cmai@ku.edu or 785-864-9208 TTY: 711. Scholarship associated with the symposium will be published in a Spring 2017 issue of the Kansas Law Review. Contact Symposium Editor Skyler Davenport at kulawrevsymposium@gmail.com. Scholarship associated with the symposium will be published in a Spring 2016 issue of the Kansas Law Review. For more information, contact Abby Hall, symposium editor, at kulawrevsymposium@gmail.com. The event is free and open to the public, but online registration is required. Scholarship associated with the symposium will be published in a Spring 2015 issue of the Kansas Law Review. For more information, contact Tamara Combs, symposium editor, at kulawrevsymposium@gmail.com. results of a federal water project that studied how climate change, population growth, and economic growth will impact water uses and availability. The event is open to the public. Online registration is required. Admission is free, except for those seeking CLE credit, which will be available for Kansas and Missouri for a $25 fee. CLE materials will be available electronically for review and printing. Materials will not be available the day of the program in a paper version. All materials must be accessed electronically. Scholarship associated with the symposium will be published in a spring 2014 issue of the Kansas Law Review. For more information, contact Kate Marples, Symposium Editor, at kmarples@gmail.com. Click on the linked names in the Event Agenda below to download CLE materials in PDF format for printing. Please note that printed materials will not be available the day of the symposium. You should print materials in advance and bring them with you, or access them on an electronic device during the symposium. Free guest Wi-Fi is available at the Alumni Center. Attendance is free and 5 hours of CLE credit are available for Kansas and Missouri. CLE materials will be available electronically for review and printing. Materials will not be available the day of the program in a paper version. All materials must be accessed electronically. Papers presented at the symposium will be published in the Kansas Law Review. Online registration is appreciated but not required. For more information, contact Kyle Kitson, symposium editor, at kyle.kitson@gmail.com. An examination of the criminal law that reins in attorney behavior in the litigation forum, including laws criminalizing perjury and tampering with witnesses and documents, and the inconsistency with which these statutes apply to the arbitral forum and why the criminal law should be amended to apply equally to litigation and binding arbitration. A review of how the recent 5-4 Supreme Court decision AT&T Mobility v. Concepcion impacts class action arbitration, viability of state unconscionability law, and preemption of state public policies. An analysis of the normative foundations of the non-arbitrability doctrine (which exempts claims from the scope of the Federal Arbitration Act if a plaintiff cannot vindicate her rights in arbitration), and an argument that the rule should apply with special force to certain statutes. A look at the Supreme Court as an activist court in arbitration jurisprudence and a "redeciding" of several of those key cases according to true judicial conservatism. An examination of the Supreme Court's modern construction of the Federal Arbitration Act as a matter of statutory interpretation jurisprudence and judicial role. The Court has largely failed to follow the Justices' own self-professed rules and beliefs regarding sound jurisprudence, expanded the scope of the FAA in ways inconsistent with the judicial role, and diminished respect for the court throughout wide segments of the legal profession and the public. 2:40 - 3:30 Professor Thomas Stipanowich - Should We Incorporate Due Process Standards for Arbitration of Consumer and Employment Disputes in the FAA? Consideration of the prospective benefits, costs and limitations of legislated due process guidelines for arbitration in consumer and employment disputes in light of current proposals to outlaw predispute arbitration agreements in various settings or implement the use of regulated arbitration. Attendance is free and CLE Credit will be provided. Papers presented at the Symposium will be published in the Kansas Law Review, Vol. 60, Issue 4 (Spring 2012). RSVP is not required, but it would be appreciated so that a sufficient number of materials may be provided. CLE materials are available for download from this website, but if you would prefer a paper copy, please note that in your RSVP email. To RSVP, or for more information, please contact Marty Rice, Symposium Editor, at KansasLawReview@gmail.com. Attendance is free, and no reservations are required. CLE Credit will be provided pending approval. 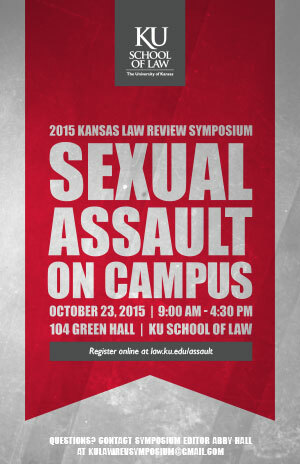 Papers presented at the Symposium will be published in the Kansas Law Review, Vol. 59, Issue 4 (Spring 2011). For more information, please contact Joseph Hinckley, Symposium Editor, at jbh@ku.edu. Elizabeth Chamblee Burch (J.D., Florida State University College of Law) is an Assistant Professor of Law at the Florida State University College of Law. Howard M. Erichson (J.D., New York University School of Law) is a Professor of Law at the Fordham University School of Law. Steven S. Gensler (J.D., University of Illinois, Urbana-Champaign) is the Welcome D. and W. DeVier Pierson Professor of Law at the University of Oklahoma College of Law. Laura J. Hines (J.D., University of Michigan) is a Professor of Law at the University of Kansas School of Law. Linda S. Mullenix (Ph.D., Columbia University, J.D., Georgetown University Law Center) holds the Rita and Morris Atlas Chair in Advocacy at the University of Texas School of Law. Tom Willging (L.L.M., Harvard Law School, J.D., The Catholic University of America, Columbus School of Law) is a senior researcher at the Federal Judicial Center. Patrick Woolley (J.D., Yale Law School) is the Beck, Redden & Secrest Professor at the University of Texas School of Law. Attendance is free, and no reservations are required. CLE credit will be offered at this event, pending approval. For more information, please contact Symposium Editor Shane McCall: shane@ku.edu. The Seventh Circuit Court of Appeals recently weighed in on reparations for slavery in In re African-American Slave Descendants Litigation, 471 F.3d 754 (7th Cir. 2006). The court raised two vital questions about the matter of enduring harm to present-day blacks in the form of social and economic disparities. How can the purported harms that present-day blacks are alleged to suffer collectively or individually as a result of the enslavement of their ancestors be empirically articulated and quantified? And what are the prospects for connecting these present harms with past harms so as to establish the claim that particular blacks today suffer enduring injury from slavery? The symposium will gather a distinguished group of scholars to explore what law can learn from empirical research on racial disparities in wealth, health, education, and the criminal justice system, and to assess whether legal reparations for slavery can be a viable means of dealing with these persistent disparities. Attendance is free and no reservations are required. 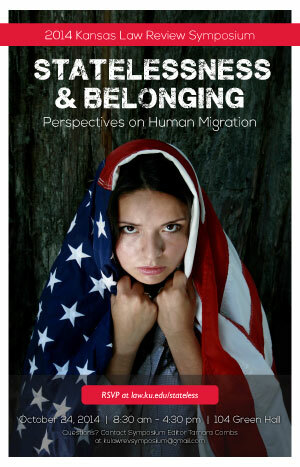 Please contact Symposium Editor Kelly Foos for more information: kfoos@ku.edu or 785-864-3463. The sponsors of this program have applied for 6.5 hours of continuing legal education (CLE) credit in Kansas and Missouri. Persons wishing to receive CLE credit can register at the door and obtain materials. There is no charge. To confirm CLE credit approval prior to the symposium date, please contact Todd Rogers at (785) 864-9257 or by e-mail at tarogers@ku.edu. 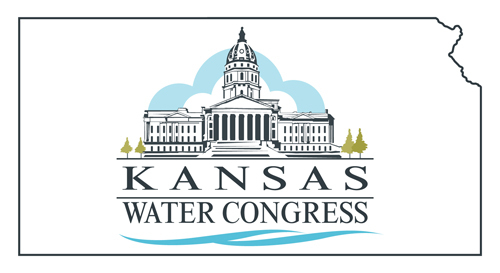 Papers presented at this symposium will be published in the Kansas Law Review, Vol. 57, Issue 4, April 2009. For more information about the articles or to order a copy of the April 2009 edition of the Kansas Law Review, please contact Kelly Foos, Law Review Symposium Editor, at (785) 864-3463 or kfoos@ku.edu. Stacy Elmer (University of Kansas): Health Disparities and Historical Injustice in Sierra Leone: A Case for Reparations? Ronald Caldwell, Jr. (University of Kansas): Expectations and the Black-White Skill Gap: Do Perceptions About Racial Disadvantage Play a Role in the Development of Minority Skill Gaps and What Are the Policy Implications? The past several years have presented a bewildering array of legal issues raising more questions than answers. Should the Food and Drug Administration approve cloned meat for consumption? Are humans patentable? Is it legal for patients to have access to developmental drugs? Should the law allow parents to halt their daughter's growth using modern scientific techniques? What is the legality of partial-birth abortion? Are stem cell research and genetic human enhancement legal? How can the current devastating loss of biodiversity be reversed? The recent explosion of the life sciences and biotechnology has challenged traditional laws, and public opinion concerning proper solutions is far from uniform. Part of the challenge is to approach these unparalleled issues head-on in spite of varying beliefs and tough scientific inquiry. Law, science, and policy, however, should also anticipate future challenges as research and development continue to flourish. The Kansas Law Review's 2007 Symposium, Biolaw: Law at the Frontiers of Biology, features world-renowned experts as speakers. Speakers at the symposium will address the above questions by exploring issues regarding the scope of the field of biolaw, patentability of human life, FDA regulation, laws concerning genetic and non-genetic human enhancement, practical biolaw issues, and biotechnology and bioethics. The event will begin at 9 a.m. with an introduction and welcome followed by panel presentations. Speakers will present their findings and then open the floor for questions and discussion. The Kansas Law Review will publish the speakers' papers. Each paper will identify and analyze issues critical to practitioners, policymakers, and the public as a whole. 10-11 a.m. "Patents & the Future of Human Evolution"
11 a.m.-Noon "State of the Art in Food & Drug Law"
1:30-2:30 p.m. "Law & Human Biological Enhancement"
2:30-4 p.m. "Cutting-Edge Legal Issues in Biotechnology"
Sonnenschein Nath & Rosenthal, the symposium sponsor, has generously organized a panel of attorneys with deep expertise in biolaw. Moderated by Rudolf H. Beese, a leading attorney in the areas of life sciences and climate change, this expert panel will offer their valuable insights on how best to meet the challenges of the many complex and complicated legal issues arising from advances in biological sciences and biotechnology. Following the symposium, the Kansas Law Review invites everyone to attend a reception, in honor of our speakers, in the commons at Green Hall. Jonathan Chester, one of the world's preeminent polar photographers and explorers, will present some of his breathtaking photography, a presentation you will not want to miss! Refreshments and snacks will be provided. Be sure and check out his website for samples of his work. Topics presented at this symposium will be published in the Kansas Law Review, Vol. 56, Issue 4, April 2008. For more information about the articles or to order a copy of the April 2008 edition of the Kansas Law Review, please contact Jonathan Grossman, Law Review Symposium Editor, at (785) 864-3463 or grossman.jon@gmail.com .